Comments Off on Have You Spotted Our New SLF Webpage? Have You Spotted Our New SLF Webpage? 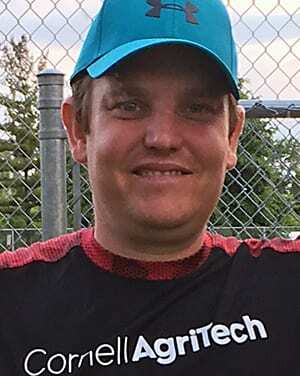 Here’s the latest on Spotted Lanternfly from Ryan Parker, Extension Aide at NYSIPM. 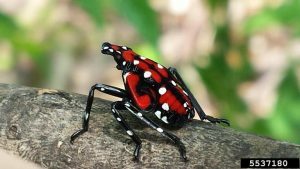 Concern over the invasive and destructive spotted lanternfly (Lycorma delicatula) (SLF) generated many online resources by states researching new and active populations. Thought to have arrived in Berks County, PA, in 2012, this showy planthopper attacks more than seventy species of plants in the United States. New York State’s primary concern is outreach, monitoring, and proactively approving 2ee pesticide labels for control. Because live adults and nymphs (and egg masses) hitchhike from states with known populations, New York State has an external quarantine. An external quarantine is a restriction of specific items that facilitate ‘hitchhiking’. In other words, if you’re traveling back from a state with an established population consider that your utility trailer, bicycle, tent canopy, or that swing set you bought in a yard sale might have SLF adults, nymphs, and egg masses tagging along. Any item that has been outside for a while needs to be checked before it crosses the border. Here’s the full list, downloadable, printable. In an attempt to educate the public and limit the spread of this pest, New York State Integrated Pest Management (NYSIPM) has teamed up with New York State Department of Environmental Conservation (NYSDEC), United States Department of Agriculture Animal and Plant Health Inspection Service (USDA APHIS), and New York State Agriculture and Markets (NYSDAM) to create the New York State Spotted Lanternfly Incident Command System (NYS SLF ICS). Currently, NYSIPM’s primary SLF focus is outreach. We’ve created materials that help identify, monitor, and manage this pest. 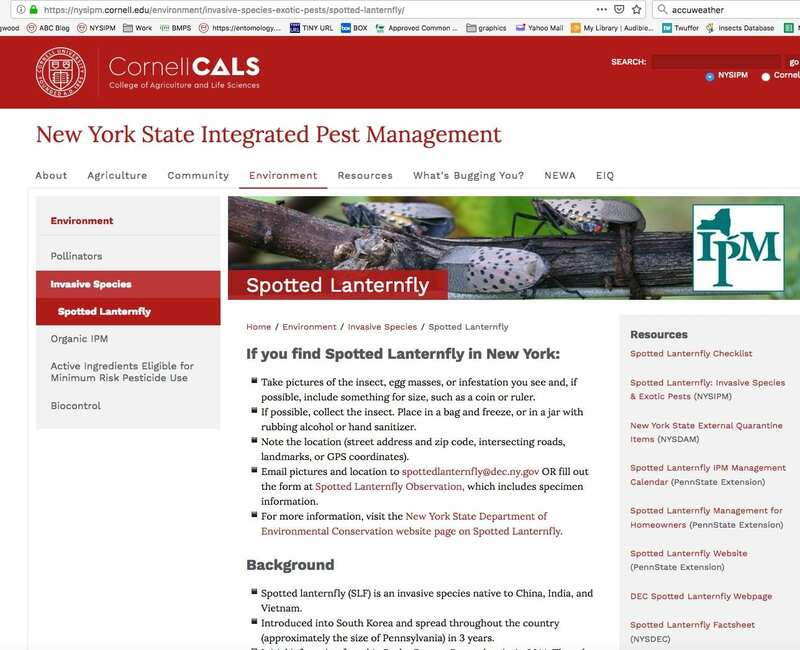 Along with the public departments listed above, we continue to remind NY residents how to report findings (spottedlanternfly@dec.ny.gov) and we provide educational materials LIKE OUR NEW WEBPAGE. Besides our many resources (Powerpoint presentations, Spark videos, posters, photos and much more), and links to other state or government agency information, you’ll find a regularly updated incidence map showing county-by-county news of SLF sightings and populations across the Northeast and mid-Atlantic regions. Coming soon, two Moodle courses from NYSIPM and our Cornell CALS collaborators. One course provides general knowledge about SLF, while the other focuses on Tree of Heaven (Alianthus altissima), one of SLF’s preferred hosts. Both offer pesticide applicator credits. 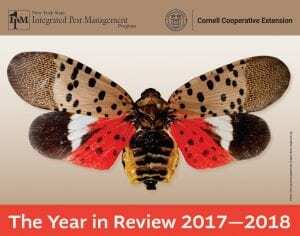 Please use your social media to share the website https://nysipm.cornell.edu/environment/invasive-species-exotic-pests/spotted-lanternfly/ with family, co-workers, acquaintances, and friends. YOU can be an important factor in reducing the spread of this destructive insect pest. If you have any comments, or concerns, feel free to email me at rkp56@cornell.edu. 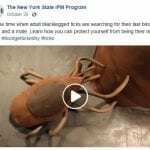 ThinkIPM – our catchall blog and a great way to keep a pulse on what’s happening in New York State IPM. Ticks in the cold was also a popular topic. And relevant to now! 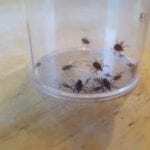 Check out these two blog posts, Ticks don’t care what month it is and Ticks and the freezing weather. Hopefully they both convince you to keep up your daily tick checks. 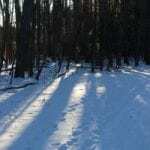 While visiting our blog, you have also been checking out older posts. Our second most popular post viewed in 2018 was a 2014 post, Identifying Your Pest – with Poop?. There are a lot of budding scatologists out there. 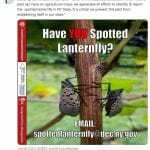 The Spotted Wing Drosophila blog has an obvious focus, but the post Spotted lanternfly found in two counties in NY captured the most views. Biocontrol Bytes was begun at the end of 2018 and many of you have been enjoying the updates on the Creating habitat for beneficial insects project. We saw a number of news reports about bed bugs in schools, so we wrote Bed bugs in schools aren’t going away in The ABCs of School and Childcare Pest Management blog. And you read it. We just wish the news reporters and commenters did too. The 2017 NEWA Survey: IPM impact includes such gems as “93% agreed or strongly agreed that NEWA pest forecast information enhances IPM decision-making for their crops”. Gypsy moths on Christmas trees? 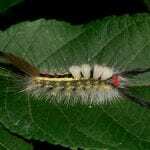 Check out the Tree Integrated Pest Management blog and see how it’s now a thing in the Gypsy Moth Caterpillars -Scout for them now post. When it comes to Facebook, video rules. Our most popular Facebook post was our claymation video, Life Cycle of the Blacklegged Tick (and Lyme Disease Prevention!). And, by the way, this claymation was part of a large Don’t Get Ticked NY campaign launched in 2018! Our new Spotted Lanternfly video, Have YOU Spotted Lanternfly Egg Masses was just posted, but it has already reached the number two spot. This invasive insect is getting a lot of attention and we need your help to keep track of it in New York. 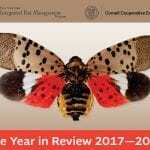 We’re not surprised that our most popular Tweet of 2018 was about spotted lanternfly. Follow us on Twitter to keep up with the latest information. 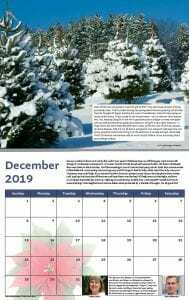 T his might be cheating, because it was just released and we have no data to show its popularity, but our 2017-2018 annual report is a 2019 calendar and everyone we have shown it to has been pretty excited. 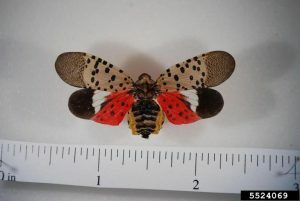 Here’s a picture of the spotted lanternfly you have been hearing about. So, as we raise our glasses to 2018 and look forward to 2019, include keeping up with NYS IPM Program amongst your resolutions. The New York State Departments of Environmental Conservation (DEC) and Agriculture and Markets (DAM) today confirmed that spotted lanternfly (SLF), an invasive pest from Asia, has been found in Albany and Yates counties. A single adult insect was discovered in a vehicle in the Capital District. In addition, a single adult insect was reported on a private Keuka Lake property in Penn Yan, Yates County. Following both reported cases, DEC and DAM immediately began extensive surveys throughout the area. At this time, no additional insects have been found. 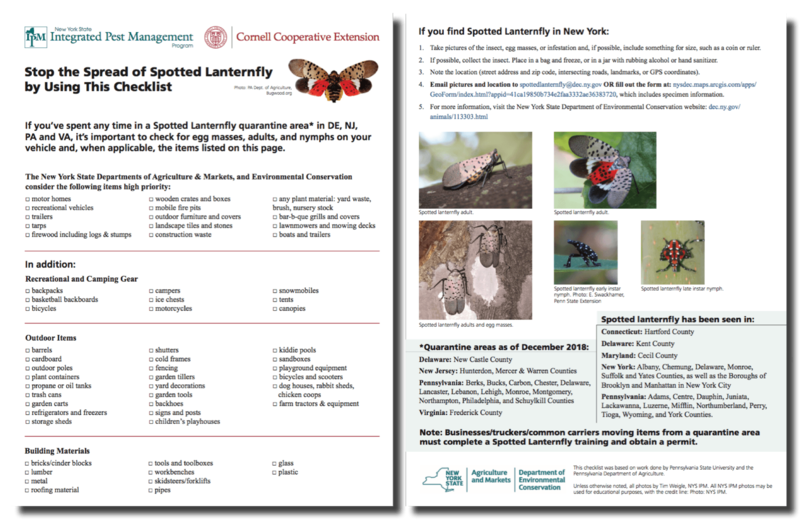 DEC and DAM urge New Yorkers to report potential sightings to spottedlanternfly@dec.ny.gov. 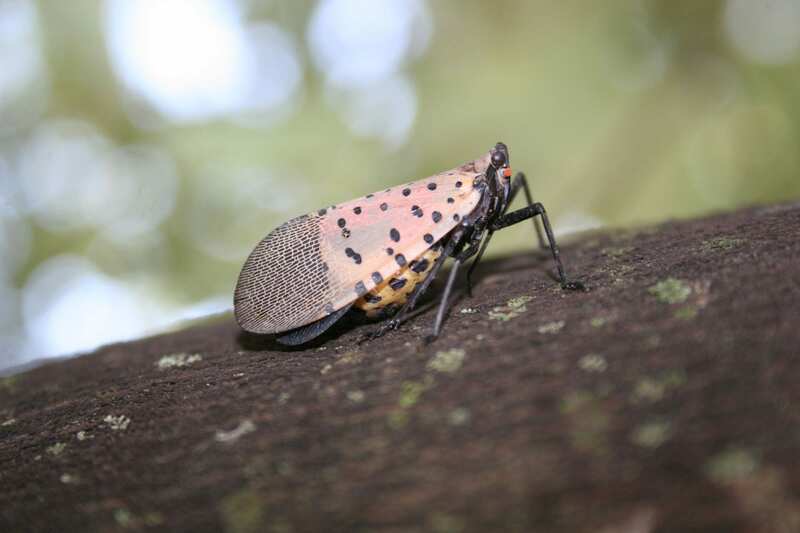 Southeastern Pennsylvania, the epicenter of spotted lanternfly’s arrival in 2014, might seem far enough away to give us in New York prep time for dealing with this new pest, a weak flyer that usually hops to get around. But with the spotted lanternfly (Lycorma delicatula—and SLF for short), all bets are off. After all, it took over Korea, whose climate is surprisingly like our own, in no time flat. And now it’s in Maryland. Delaware. Virginia. New Jersey. New York’s first find happened to be dead. Blind dumb luck. How anything so pretty could be so nasty boggles the mind. But it’s the nature of nature. Since ID’ing SLF correctly is key to good IPM, let’s start with the nymphs—the young-uns. In this case they come in two snazzy colors. The early-stage nymphs are straight-on black or, once they’ve molted, black and white—handsome devils or trendy fashionistas; take your pick. For late-stage nymphs (late-stage means they molted—again—and outgrew the skin they had after they hatched), add blobs of blood-red, and that critter looks ready to conquer the world. Does that bright, traffic-light red signal toxicity, as it does for many other potential prey? Right now all I know is that birds have been seen throwing up after grabbing one for a snack—and yes, they are toxic to us. Meanwhile, adult SLFs look positively benign. Lovely, in fact. Don’t believe it for a minute. These classy lads and lassies resemble butterflies or moths, but don’t believe that either—they are, you’ll recall, planthoppers; the name refers to its mode of locomotion. Whatever. Spotted lanternflies have a destiny. Their natural expertise in the pole-vault isn’t their only way to get around. How many roads (think interstates especially) wend their way from southeastern Pennsylvania to points north, south, east and west? Lots. Consider your car or camper, for starters. Firewood? You’d be slack-jawed at the degree to which firewood fits into the equation. Just the eggs alone—not easy to see with a cursory look—can easily hitch rides to new areas, meaning that New York is a mere hop, skip and a jump away. Trains, tractor trailers, wheel wells, the cargo hold in a jet—this pest doesn’t need to lay its eggs on organic matter. Planning a long-distance road trip? California, here we come. Which is why you, dear reader, are our eyes on the ground. But wait. Other than toxicity, I haven’t even told you why to be alarmed about this critter. Grapes, apples, hops—these and more high-value crops rank in the billions for New York. Apples alone ring the register at about $317 million. filtering and buffering clean drinking water for millions of New Yorkers. 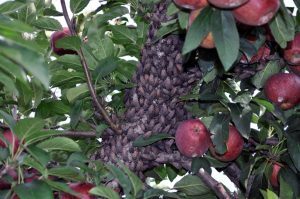 heaps of honeydew under trees and vines and covered, often as not, with black sooty mold. Besides fruit and hops, what’s at risk? Everything from willows to walnuts—and smooth-barked trees especially. But keep in mind that many a mature tree which, once it has packed on the pounds around its waist and takes on a decidedly rough or furrowed look, looks svelte and clean-cut while still relatively young. Go outside and look at any gently-furrowed tree, and chances are you’re looking at a host. For those areas where tree-of-heaven runs rife, well—you’re looking at what might be its most favorite host of all. Now think about honeydew. Not the drink, not the melon; rather the stuff bugs secrete as they feed. A case of in one end, out the other as they move down the chow line. Although native insects also secrete honeydew, the size of the SLF and staggering numbers that congregate from place to place makes for a remarkable amount of honeydew. Parked your car beneath an infested tree? Time to clean off those sticky windshield wipers. For sure—this sticky mess and the swarms of insects it attracts gets in the way of outdoor fun. In Pennsylvania, where SLF populations are the densest, people near the heart of the problem can’t go outside without getting honeydew on their hair, clothes, and whatever they’re carrying. At which point “outdoor” and “fun” no longer have all that much in common. So that’s it in a nutshell and, for spotted lanternfly, all the news that’s fit to print. For now.